Congregation Or Chadash has many committees and new faces are always welcome. Where would you like to put your talents and energy? Check the Our Volunteers page for the list of chair persons. Adult Education Committee : The Adult Education Committee plans events that we hope will interest and educate our adult members. Events include Movie Nights, B’nai Mitzvah class, Lunch and Learn (various topics), a tour of Jewish Baltimore, and book discussions. Brotherhood : The Congregation Or Chadash Brotherhood provides an opportunity for the men in our temple to experience the bond of brotherhood and participate in activities dedicated to enrich our Temple family. The Brotherhood also allows us to expand our circle of friends to provide a support network for each other. The Brotherhood is an “arm” of our congregation, which enables us to fulfill our interest and willingness to serve our Temple family by volunteering available time and effort to help the Temple in whatever way we can. We take pride in our participating and “giving something back” to our Temple to foster Reform Judaism in our community events. College Outreach : This group keeps in touch with our college students who are away from home, sending cards and care packages throughout the year. CORY (Congregation Or Chadash Youth): CORY is our senior youth group for students entering 8th through 12th grades. Our teens interact with other Jewish teens in social, social action, and educational activities. Group activities are planned throughout the year by the CORY members. In addition, CORY members can participate in regional events and meet Jewish youth from Reform congregations throughout the Mid-Atlantic region. This is a fun and exciting opportunity for all of our teens. Finance Committee : These money managers help the President, Treasurer and the Board assess our finances and discuss the best way to secure our financial future. Focus Newsletter Editor : It’s a big job to get our bi-monthly newsletter out the door! Contact our newsletter editor to offer your assistance. Fundraising Committee: This person or these persons would plan various fundraising events and other activities throughout the year. Hineini Coordinator : Going through a tough time? Hineini is here for you. This group can provide meals or other services in your time of need, whether you’ve had a death in the family, an illness, a birth or anything else where you need a little extra help. Holiday and Festival Parties : These party planners coordinate the food and other necessities for our various parties and festival celebrations, such as the Sukkot Festival, Purim Carnival, and Tu B’shvat Seder. Jr. CORY : Jr. CORY is our youth group for students entering 4th through 7th grades. Youth group for this age helps provide the opportunity outside of the congregation for children to build and strengthen their relationships with their Jewish school peers. Activities include field trips, team building exercises, and games, both with and without Jewish themes. Kiddish Kids : The Or Chadash Kidd-ish Kids is a Jewish youth group for children in Pre-K– 3rd grades. Through stories, activities, field trips, and food, our congregation’s youngest members develop a strong Jewish identity while starting and deepening friendships with other Jewish children. The group’s members learn about Jewish values while having fun with their friends. Parents and siblings are welcome to join the different events. Library Committee : The Or Chadash Library welcomes you to come in, look at the collection, and borrow something that might interest you. Thanks to all who have donated books and other media–please keep the donations coming. A library donation is an inexpensive but lasting way to memorialize a person or special event. Just include a donation form–they can be found on the table in the library–into your gift of a book, CD, DVD, etc. so that we can properly thank you, and include a donation sticker in your donation. Our catalogue can be found online at http://www.librarything.com/catalog/OrChadashLibrary. Marketing Coordinator : This person would work in conjunction with other temple groups to advertise upcoming events and arrange for other publicity. Please contact Deanie Preston, Temple Administrator, if you are interested. Membership Committee : Every congregant is a de-facto member of our Membership Retention Committee. Reach out to our current members to keep them involved and reach out to the community to attract new members to Or Chadash. We always need new members. We could also use people to plan and organize member retention activities. Oneg Shabbat Committee: The Oneg Shabbat committee organizes the calendar for our families to sponsor onegs on Friday nights and other holidays. The members of the Oneg Shabbat committee help the sponsoring families to set up the food and candles so the sanctuary is ready when services begin. Most committee members choose one Friday per month that they are able to be at services. Or Chadash Singers (OCS) : Our adult SATB (Soprano, Alto, Tenor, Bass) choir, OCS sings at High Holiday services and selected other services and events throughout the year. In addition, OCS participates in regional Jewish choral activities – including the 350th Anniversary celebration of Jews in America at the Music Center at Strathmore; Prof. Jose Bowen’s Klezmer Shabbat and Jazz Shabbat concerts, at Gaston Hall in Georgetown Univ. ; the recent URJ Biennial Choir, at National Harbor; as well as regional composer–in–residence weekends featuring Ben Steinberg, Simon Sargon and most recently Dr. Joshua Jacobson. Practices are held Monday evenings, as needed. Religious School Committee (RSC) : The RSC works with the School Administrator and Education Director to keep our school running smoothly. This committee works on curriculum updates, teacher evaluations, and makes policy recommendations to the Board, among other things. It meets on the first Wednesday of each month. 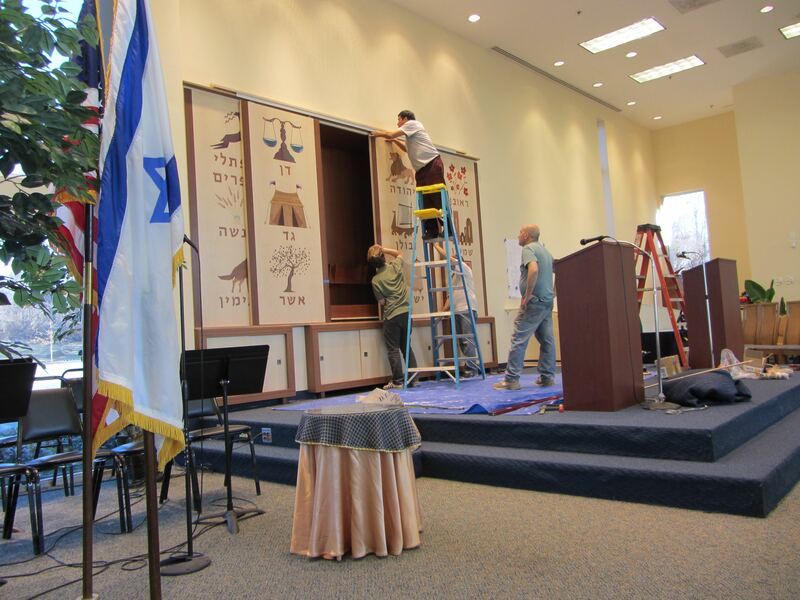 Ritual Committee : The Ritual Committee provides input and support to the rabbi and musicians as they prepare services throughout the year. This committee works on a range of worship-based questions, such as relating to Bar/Bat Mitzvah, time of worship, and larger issues including the Bimah improvement project. Social Action Committee : Working to make the world a better place and contributing to our community are such important values in Judaism. Anne Frank wrote, “How wonderful it is that no one need wait a single moment to start to improve the world.” Let’s work together to honor that sentiment. Contacts: Linda Stein and Eve Shalley. Technology Committee : Keep our computers and phones running smoothly. Webmaster : Help maintain Or Chadash’s presence on the Web. Women of Congregation Or Chadash (WCOC) (formerly known as Sisterhood) : Want to participate in a variety of activities with a wonderful group of women? Then WCOC is for you. We have an ongoing book group, hold a Passover cookoff, sponsor an annual mother/daughter tea with a coat drive, play mahjong, lead an annual WCOC Shabbat, and take an annual visit to a mikvah. We often have “Girls Night Out” at a variety of local restaurants with various venues. Come and join the fun. The first year is free to new members.